According to UNICEF, the adult literacy rate in Haiti is 48.7%. We strongly believe education is a key factor in empowering a community. Seeing the need within the community we serve, we made a decision to do something about it. In April of 2015, we began a literacy program for women in the community. Currently we have 20 women participating in the program. The women gather at the church three times a week to read and write together. Can you imagine living most of your life not knowing how to read and write? Every time I look at this photo, my eyes tear up. Partly with sorrow but mostly with JOY! 66 year old, Micheline learning how to read and write. Micheline is an inspiration. At 66 years old, she had a dream of learning to read and write. Her dream became a goal. 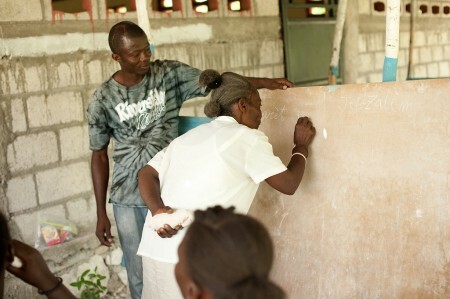 On July 26th, Micheline achieved her goal and graduated out of the literacy program. Thank you Warsaw Missionary Church and Living Hope Ministries for financially supporting the program.